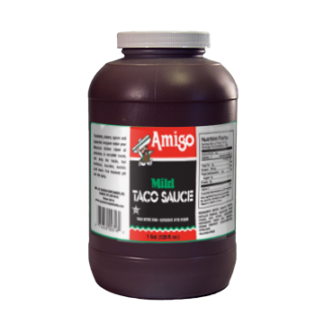 Amigo Mild Taco Sauce - Garden Complements, Inc.
Full flavored yet not too spicy, Amigo is a mild taco sauce made with tomatoes, onions, spices and imported oregano. Great for tacos, tostadas, burritos, nachos and more. 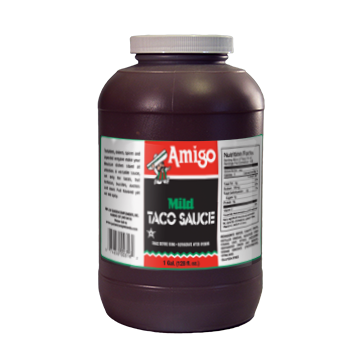 Amigo Taco Sauce is extremely economical making it ideal for school and institutional use. Extendable without sacrificing quality or flavor, Amigo has a long history of pleasing all kinds of palates -- from children to adults. With such a great price point, you can afford to let people drench their products in this spicy goodness.